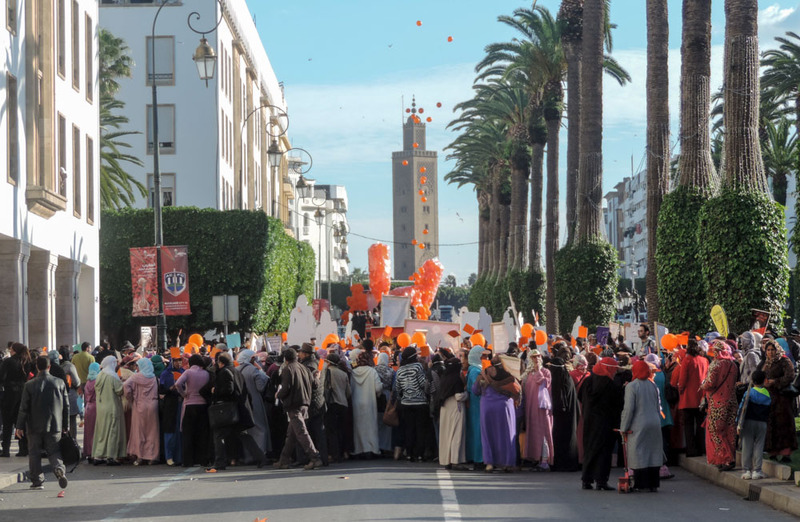 Kenitra is another of those places I seem to collect that people will not even know they existed before I mentioned them. I think the only thing it has going for it is that it’s close to Rabat. I went out for some food last night and it was nice, there even was a musician that serenaded me and the other two customers. The hotel was interesting too. It had shared toilets, the male was turkish style and no toilet paper, the ladies was western style with toilet paper. I’d call this sexual discrimination. The route today took quite a bit of inspiration from yesterday experience, straight down the national road no ifs no buts. It is quite funny though, when I say national road you probably think dual carriageway heavy traffic and so on. The truth is that it looks like your average UK A road and you’re just as likely to meet a lorry as you are of meeting a cart and donkey. In fact sometime you meet a lorry overtaking a cart and donkey while going around a bend in the opposite direction as you are. The fact that I live to tell the tale should however let you realise that it not as bad as it sounds. Anyway, back to the ride. Not much to tell apart from the fact that I explored a building site that turned out to be what will be the next golf resort designed (the golf course) by Colin Montgomery. It was unimpressive apart from my marvelling at the use of home nailed together stepladders on a construction site. The fun police has not come to Morocco yet. 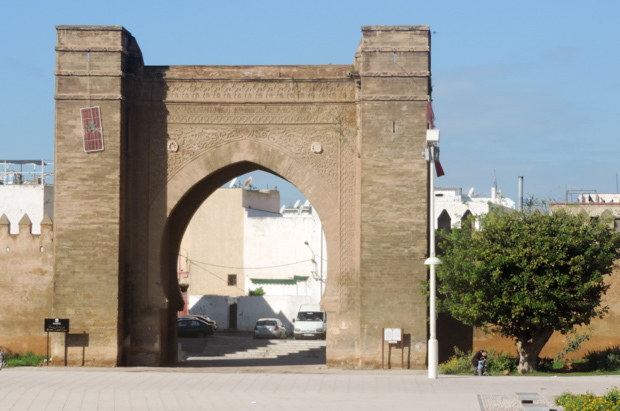 Then I got to Rabat which had been described to me in ways ranging from: “waste of time” to “nothing to do and see”. I must have not got the country all wrong as I quite like it. Or perhaps it’s that girls here wear jeans and short sleeves shirts. I guess it’s familiar and therefore unthreatening. What???? 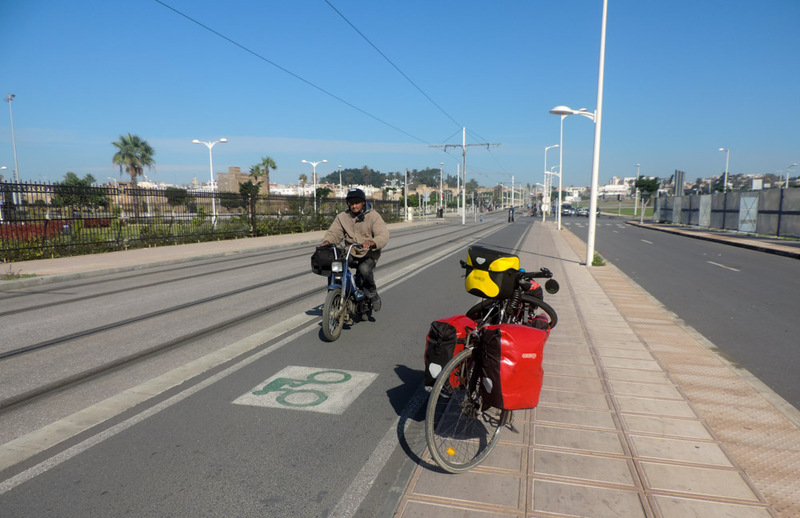 a bike lane in Morocco? There also are bicycle lanes, well one of them. The only problem is that they are used by me and a whole load of moped and scooters. Perhaps it’s the same as when I used to stop at the front of the cars in the intersections in the UK in the place marked for bicycles but I was riding a motorbike. I cannot really complain about things I did too. On a more serious note, I saw an Amnesty International demonstration in one of the main avenues and, while there were many uniform and twice as many non-uniform policemen, it is refreshing to see freedom of speech in action. For sure it’s a nice counterbalance to the schoolchildren parade of the other morning. More serious sightseeing tomorrow and a bit of relaxation getting ready for embassy galore on Monday. Mauritania for visa early in the morning and then again in the afternoon to collect it and Senegal in between. Hopefully will all be done on Monday but I am booked in to Wednesday just in case. I am in two mind if it might be a good idea to go to the Gendarmerie to check on the situation in Western Sahara. UK foreign office advice for western sahara https://www.gov.uk/foreign-travel-advice/western-sahara … you’re probably ok if you travel fast as you can pedal and stick to the coast. The its gets a bit dodgy at the border to Mauritania.. True, and indeed Western Sahara is the least of my worries, on the other hand JB, and Helen for the matter, went through there in the pre IS era. Much has changed in the haircut styles offered in the Magreb. tried googling to connect IS (ISIS, ISIL) to west saharan africa and there are zero results. The closest you can get is calling Boko Haram the ISIS of Africa but no real connections… need to make sure you can get across the western sahra borders though. independent travellers risk getting turned back.